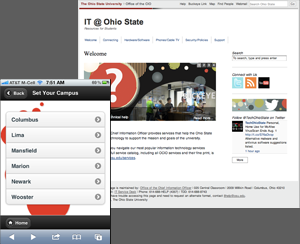 ocio.osu.edu/blog/guide – An orientation to services with full-browser and mobile views. The content is stored in a WordPress site and reused between views, but isrearranged to suit the screen size. Planned requirements and selected underlying technologies. Coordinated development across distributed team of developers. Learned jQuery Mobile and ThemeRoller to write mobile view. Devised custom CSS tagging structure and wrote coordinating jQuery to hide/show content by selected location. Adapted graphics from a related print piece. ocio.osu.edu – A CMS-based site for OCIO services, processes, and announcements that replaced 8 other sites. Provided project vision for an interdisciplinary project team and executive stakeholders. Managed timelines and prioritized tasks. Led collaborative sessions to design an information structure that integrated with existing systems for help and services. Created wireframes and mockups for testing. Worked with content owners to transition from flat html sites to the SilverStripe CMS. *This project received a Team "Going the Extra Mile" award from the OCIO. ocio.osu.edu/blog/community, ocio.osu.edu/blog/team, & ocio.osu.edu/blog/newslink – A scalable, multi-contributor blogs for announcements from Ohio State's OCIO. Established WordPress blogs in place of static HTML sites for key announcements. Planned category/tag structures to support targeted RSS feeds into related sites. Worked with the application administrator to introduce new widgets, features, and template options. Provided contributor access and education. A trio of HTML-formatted email messages for deans, directors, and chairs at Ohio State; OCIO staff; and administrative systems users. Wrote a series of stable HTML templates to work with a broad range of email clients. Devised a production process for testing messages locally. teachyourselfiphone.com – A site built in WordPress to promote and extend content for 2 books. Customized a layout from WordPress Remix templates. Created graphics consistent with the publisher's branding standards. *Fun Fact: Many projects in these books use my photographs and illustrations, including a hopping bunny that demonstrates animation. no longer online - A CMS-based website for eLearning systems and services. This site merged content from 7 existing sites in a unified site. Led a technical team to evaluate CMS options from the set of systems already in use at Ohio State. Worked with content owners, designers, and developers to plan and implement the site in under 3 months. Developed a main page model to dynamically pull content from other sources. *Here's an overview of the project used during the kickoff meeting. floraphotographs.com – My personal website to display photographs for use as wallpaper or ecards. Designed the site layout and graphics. Programmed a database-driven image gallery and search feature in PHP. 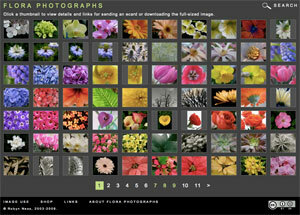 Photographed a lot of flowers and plants. registration.it.ohio-state.edu - An online registration site for workshops and events. This system, built in Drupal, replaced 2 ColdFusion systems that were no longer being maintained. Led requirements gathering and feature prioritization. Managed priorities and developers to reach a finished product by deadline. carmenwiki.osu.edu - A Confluence wiki installation. Worked with a technical team to plan a multi-option login process for OSU users and guests. Learned enough Textile markup language to streamline the main page interface and customize text and presentation. no longer active – A website to educate instructors and university administrators about online teaching practices and technologies. Worked closely with subject matter experts on content development, including embedded video. Designed information flow and page structures. Solicited and incorporated feedback from test audiences. no longer active – A website featuring the services, resources, and announcements of Technology Enhanced Learning and Research. Developed a sitemap and page wireframes. Tested page layout and navigation with users. Incorporated graphics created by a visual designer. Coded pages in HTML and CSS. An HTML email message to TELR stakeholders. Designed a simple page template using HTML and inline CSS for compatibility with a broad range of email clients. no longer active – A website to present information concerning Ohio State's course management system. Collaborated with a visual designer on graphic design. *Here's a presentation about designing this project that I gave for students during the Research on Research program at Ohio State. 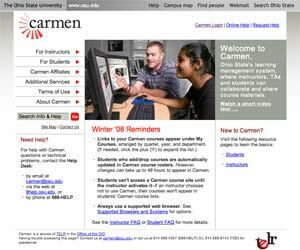 elearning.osu.edu/carmen-help/instructors – Online help pages for Ohio State's course management system. Restructured navigation alphabetically by tool name to facilitate point-of-need use. Worked with eLearning consultants to revise page-level content to orient users to tools and best practices. Added a search feature that includes other relevant campus sites. Postcards to promote Ohio State's course management system. Collaborated with a visual designer on format and concept. 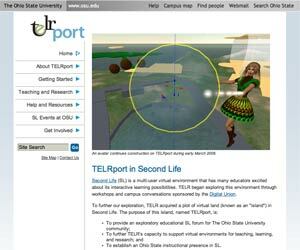 no longer active – A website to introduce TELR's Second Life pilot project and virtual island. Developed a sitemap and navigation. Reused the template from the Carmen Info site to cut development time. Revised and formatted content provided by an eLearning consultant. no longer active – Websites to provide pedagogy information about clickers and mobile learning (classroom wireless). Collaborated with a graduate research assistant to develop site architecture and revise content. Adapted a standard Ohio State template. no longer active – A website to streamline transfer of teaching materials into a new course management system. Collaborated with a programmer and eLearning consultants to plan user experience. print piece – Information for students about the myDenison portal. Laid out text and graphics. print pieces, pdfs, html – Course catalog and handbooks for Denison faculty and staff. Trained college support staff on using an XML editor. Performed data transformations to produce finished documents. 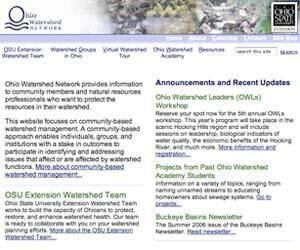 ohiowatersheds.osu.edu – A website to present information about OSU Extension's watershed program. Created a visual design to coordinate with an existing brochure. Developed a databased-driven interactive map in PHP for locating watershed groups in Ohio. Worked with a senior developer to incorporate custom code for file upload. *Received a 2005 Web Access award from Ohio State's ADA Coordinator's office. jobs.joe.org – An ecommerce site for posting jobs in Extension, outreach, and higher education. Consulted with prospective users to develop a flexible, regulation-compliant job posting format. Programmed a database-driven job posting system and an administrative backend in PHP. Worked with a senior developer to incorporate custom search code. Arranged online transaction handling with vendors. 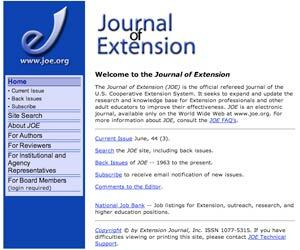 www.joe.org – The refereed journal of the Cooperative Extension System. Restructured site navigation and refreshed visual appearance. Performed production work on 24 issues and developed a server-side include structure for storing article elements efficiently. Developed a PHP-based comment form for use with commentaries. 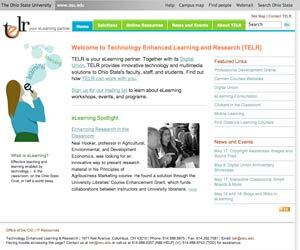 no longer active – The news section of Ohio State University Extension's website. Developed a database-driven system in PHP for displaying and managing news articles. Designed a printer-friendly page format. 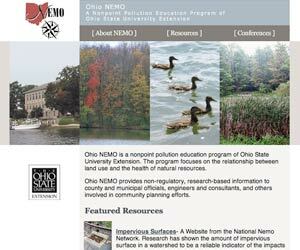 nemo.osu.edu – A website for educating municipal officials about water pollution. Created the visual design, including refreshing the logo. Built page templates in HTML and CSS.